We’ve come to the end of the Listening to Music Without Understanding It series, I hope you’ve enjoyed the throwback! This is me finishing up my first series of music posts, which have been vaguely connecting through veins of me sharing some of my favorite bands, and talking about how I interact with and find music. Two sides of the same coin, since one of the best ways to find music is through recommendations, and, once recommended, through sampling the music yourself. Hopefully you’ve found someone new or something you like through my writing, because I know your comments and recommendations have helped me find some new music. So let me know in the comments below what you think of my music series, or the Broken Bells, or who your favorite band is, or really, whatever you like! 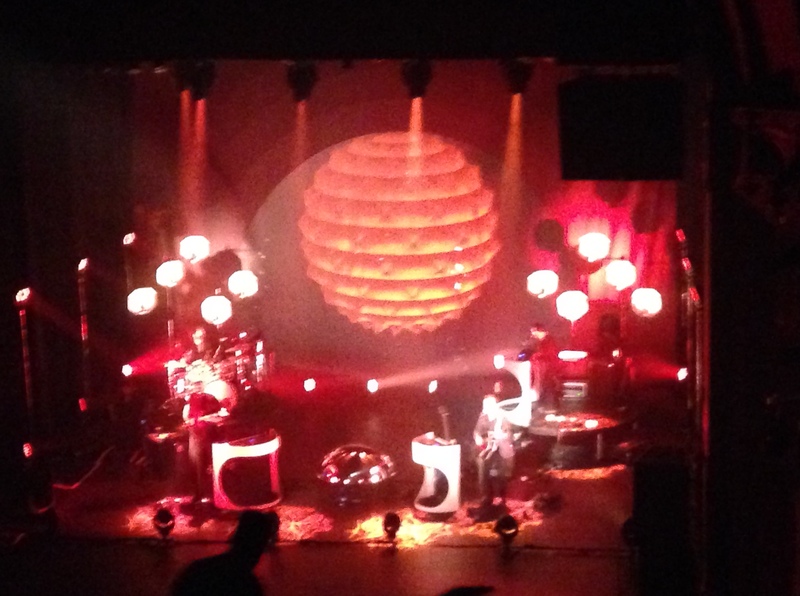 But for now: Broken Bells! As the band came out, it was the vocals that play at the beginning of their recent music video, for Holding on for Life. And on the screen at the back of the stage, projected from a circular mirror array in the middle of the stage, was a reflection of the audience. Spotlights flowed around the audience, which started to bounce and beat and get excited and flow with the start of the music. 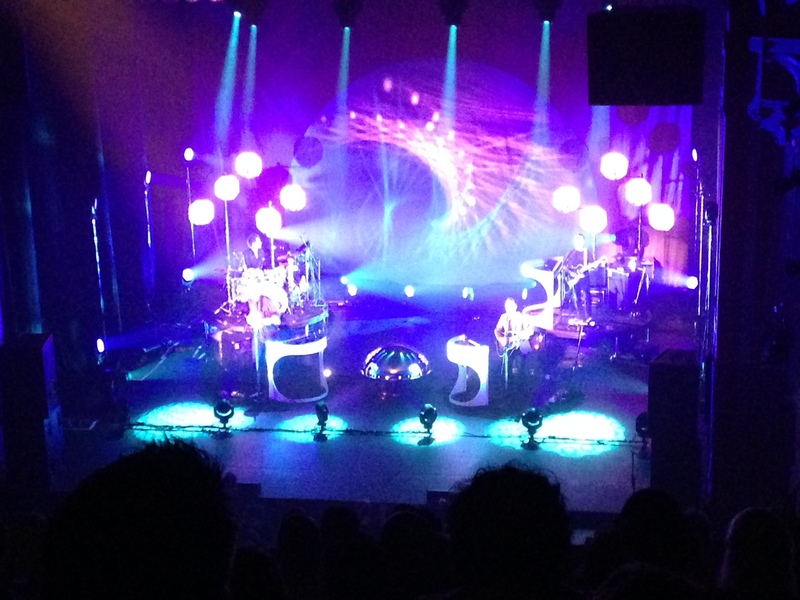 The show opened with the first song from their new album, the album they’re touring for, After the Disco. The song is called Perfect World, and it set a stage. The song opens with about a minute of just instrumental, of just them playing. It was a great warm up, a great way to get us in and excited and get things started. On the screen, they panned away from the audience. Up, into the sky. To the Earth – with a great night sky shot, with all the cities lit up, their own little stars. It pans out further – off and away. Planets. Pulling away further. And then, suddenly, warping away, all with the music. They took us out, away from home, somewhere else. They took us to a place of sound, of music, away from home and worries, for a while. For their second song, they played my favorite: The Ghost Inside. I’ve referenced before the power and influence this song holds over me. It was pretty powerful still, it hit me pretty hard. I don’t think I was the only one – there were people dancing in the aisles ahead of us. But honestly? The best part was the end. James Mercer got us all clapping, got us in time. And they flowed, through this time, seamlessly from The Ghost Inside to After the Disco. It was magical. It was really the beginning of me rethinking their music, of me seeing it in this new light – of them blending and merging their two albums. They did this also on the screens with highlighting a character, mostly a silhouette, of the girl from the Holding on for Life video. I’m not sure if she’s meant to be the same character as Christina Hendricks was in The Ghost Inside – I would understand, I imagine she’s harder to get in a music video these days. Nonetheless, she became this recurring character throughout our journey for the evening. So, they transitioned it into The Mall and the Misery. They did a lot with light during the show. Projections like stars on the theater ceiling, projected rays of light while we were warping away into space. Darkness between songs. It was after The Mall and the Misery that they first did one of their big shifts during the silence: suddenly, they were in a new position. With Danger Mouse in a seat, playing the guitar, and Mercer next to him singing (and later, whistling), they played The Angel and the Fool. A beautiful song, and fun in the presentation as well. I saw it, and felt I just had to get out my phone (limping along on its last few percent of power) and snap a photo. I love how it turned out. I won’t drag on and talk about every song they played – they eventually got in 18 (I think) of their 25 songs from their albums. Pretty good representation! From a little later in the show… I think this was Vaporize. 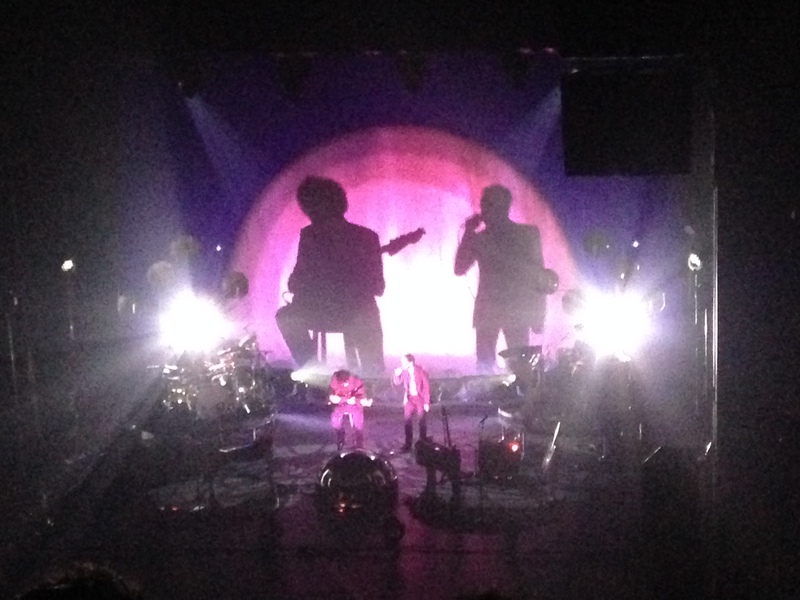 See James Mercer, front right, on the acoustic guitar… and Danger Mouse back left on the drums! They closed out with the first song from their first album: The High Road. Interesting symmetry with that, and a good way to close out on a known single. As The High Road was playing, the projector showed us warping back home, finally landing back to Earth, at night, and finally pulling back in to the theater, to the audience, live, then, there. It was really something. As far as symbols go, taking us all out into the cosmos, with nothing but music and fun, and bringing us back at the end… that’s a pretty good one to base a concert around. So of course, the crowd went wild. We clapped so long it was almost like, “no encore?” But no. Out they came, just Danger Mouse and James Mercer. Acoustic guitar and keyboard. And they played a song I had been sorely missing from the concert: Citizen. This soft, beautiful song… and played acoustic, for that awesome, authentic concert-going experience. At the end (or kind of halfway-point) of the song, it goes all instrumental, and that’s when the other two band members came back out and joined in. It reminded me that they aren’t that well known of a band. Before the show, I was looking around. Trying to figure out if I could spot true fans and people brought along for the ride. There was everyone there: kids (a Sunday night show – but in summer, so it works, I guess), teens, adults all the way up. A real mix. Once the show started, though, and the audience hummed, there was no question in my mind that I was with fellow fans. While they played, all of us were fans, everyone was into it. The thought that maybe they don’t get an audience wanting an encore everywhere… it saddens me, and makes me want to spread the word about who they are that much more. First up, I really do recommend watching The Ghost Inside. Not only is it amazing, but it’s a well-acted, internally-complete science-fiction story. Starring Christina Hendricks. So really, the only crime is that it only has about 2.5 million views – I would think that having a celebrity in it would draw more views just for that aspect. Anyway, here, let me help you with watching that. Like that? The song titles linked above are links to other music videos, as well. And there’s other live performances and such on their VEVO channel – Including the full live show from Letterman I mentioned last week. 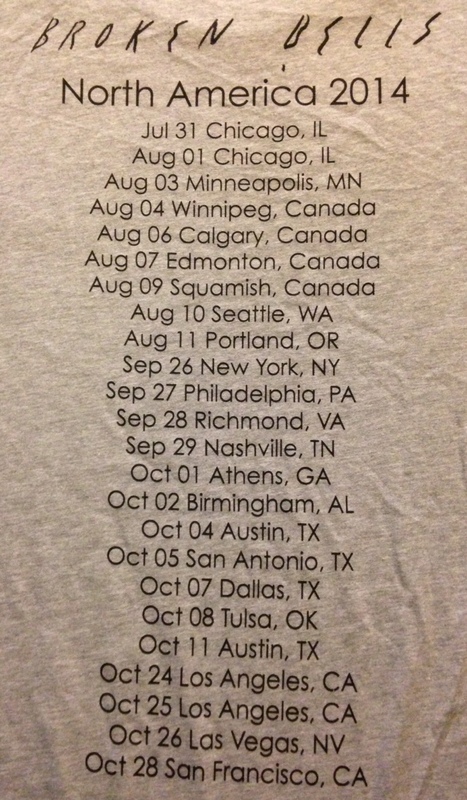 The Broken Bells North American Tour… from the back of the T-Shirt! They have two albums – the eponymous Broken Bells, and After the Disco. I love both dearly, but I think starting with the first album really is a good starting place. They actually played more from the first album than the second at the concert, even with it being the After the Disco tour. They also have an EP, Meyrin Fields, for a little more for the fans. They made a two-video short film with instrumental from After the Disco, as well, which I’ve only recently found… it’s where the video for the Holding on for Life music video comes from, it seems. Check out part 1 and part 2! Starring Kate Mara and Anton Yelchin, I might add. And their North American tour isn’t over yet. It’s on a short hiatus, it seems, and will be back at it soon. There might still be tickets if they’re showing up in your neck of the woods, who knows? But I guess, this has been me, giving them their encore. It’s such an interesting way to think about music, musicians, performances. They’re there because the audience is, and the audience because they are. Who should really be thanking who? Or are we all just traveling away together, going somewhere else for a short while before coming back to Earth?